As Noggin and Knut look up at the moon and stars one night, Knut contemplates the question of life on the moon. Noggin can only offer that, despite looking like a big lump of cheese, he doubts that this is what the moon is made of. The next morning, it is Knut's ceremonial duty to lead Noggin's horse, Old Fatty down to the new trough in the town square, where he will be the first horse to drink from it. As Knut and Old Fatty arrive at the trough, the music stops suddenly and everyone looks upwards. Out of the sky falls a shiny silver ball that lands in the trough with a large splash. 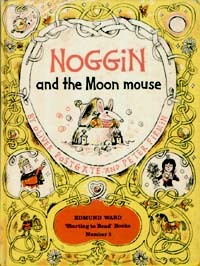 As the Nogs hide in fear, a small door opens in the ball and a large mouse-like animal with a very long nose climbs out. Noggin orders Thor Nogson to speak to the animal. He approaches the animal with his sword drawn. The animal reaches out to touch the tip of his sword, and feeling its sharpness runs away, chased by the children, eventually settling in a hole high in a tree. Knut fetches a birdcage and puts his hand in the hole to try and capture the animal, and after being bitten finally grabs the animal and puts it in the cage. When Nooka sees the caged animal, she makes Knut release it and gently holds it in the palm of her hand. They try to feed the animal, but after offering biscuits, jam and sausage, they are ready to give up when the creature leaps into the garden and proceeds to nibble at a moon-daisy. Nooka asks the animal where he comes from, and he gestures to the stars. The moon mouse the takes Nooka's hand and leads her to the grocer's shop, where they acquire some oil, some vinegar and a box of soap flakes. They then all return to the trough, where the moon mouse opens up 3 stoppers in his space craft and pours in the oil, vinegar and soap powder. The moon mouse hands Nooka a bright moon-stone stone from inside his craft, shakes hands with Noggin and, stocked with plenty of moon-daisies to eat on the voyage home, disappears inside the ball and closes the lid behind him. With a gurgling noise, the craft lifts up on a great plume of bubbles, which spread to cover everyone. By the time the bubbles clear, the moon-mouse is gone.